We dress up for our weddings to add an extra sense of reverence to this age-old tradition. And if you truly want to have a glorious wedding day, then you are going to need to find a dress that is up for the job. Keep an eye out for the right dress when shopping with your granddaughter. You never know where you might find it. Here are a few examples of styles of wedding gowns to give you an idea of what is out there so that you look amazing on your wedding day. When most women imagine their wedding dress, they think of a long, flowing train, sweeping effortlessly down the aisle. But today's modern bride might not want to stick with every single wedding tradition. She might want something to make that day exclusively her own. Many designers out there today produce stylish wedding dresses that would look just as natural at a fancy cocktail party as they would inside of a church. That is to say; they would look normal at another event in any other color. In versions of white, they still look exclusively designed for a bride. Imagine a bridal dress that hangs just above the knees. It is strapless and made from Silk Satin Faced Organza. Alencon Lace appliques dance about this dress and a large hand-made floral corsage ties up at the back. You can find this elegant gown in classic ivory color. 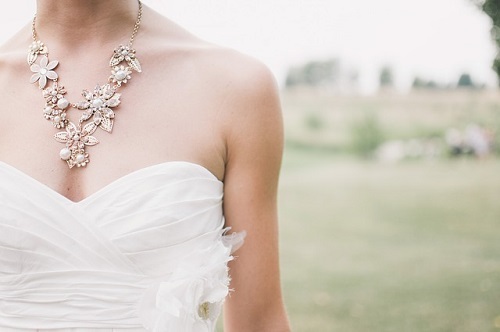 This blends perfectly with ivory flower girl dresses that look simple yet very elegant. Many young girls dream of being a princess when they grow up. They long for the day when they can find an incredible wedding gown that fulfills all of their fantasies. One trend in bridal gowns today is that classical princess style. Women may have dreamed of this dress as a child, but somewhere in their minds, they still might long for it as an adult. The regal look is increasingly popular now, and there are many different dresses out there that can satisfy that desire. Picture a dress that starts simply enough at the top. It is strapless with ornate Venice Lace across the bodice. Hand-draped English Net flows from the waist all the way down to the floor, creating a see-through effect that highlights the additional Venice Lace along the hem of the skirt. This dress comes in ivory and will have the little girl inside you jumping for joy. You can choose to match the style with white flower girl dresses for the little ones. A lot of brides today want their wedding to be all about "the now." They appreciate the tradition of marriage and may even still want to practice all of those special events on their big day, from being given away by their father to throwing the bouquet at the end of the night. Still, they may also want to wear a contemporary wedding dress that honors the styles of the past while simultaneously breaking away into the future. One dress out there today begins with V-neck straps that crisscross from the shoulders down to the bottom of the bodice. One strap even features a bouquet of gorgeous hand-made silk flowers for an extra dash of elegance. This dress has a high empire waist, which accentuates all of your features and curves. From there, the dress delicately hugs the waist and then flares out dramatically. Just above the knees, this wedding dress continues its modern take on an old style. It appears to have fine lines that take the dress every which way, giving it distinct lines wherever you go, while still flowing effortlessly about your body.